Dental implantation is the process of replacing a missing tooth or teeth that cannot be saved by conventional means. A dental implant is a "root" device used in dentistry to support restorations that resemble a tooth or group of teeth. Dental implants will fuse with bone; however they lack the periodontal ligament, so they will feel slightly different than natural teeth during chewing. Dental implants can be used to support a number of dental prostheses, including crowns, implant-supported bridges or dentures. The use of dental implants permits unidirectional tooth movement without reciprocal action. Cement retained: This is the most common implant technique, which is created using either a prefabricated abutment or the use of a custom made abutment depending on the location of the fixture. The abutment is designed to get the optimal alignment for the implant crown within the patients arch. There are a number of options that can be used for the custom abutment, thus being cobalt chrome, titanium and zirconia. A crown or bridge is then designed to seat over the abutment depending on the requirements of the patient/dentist. 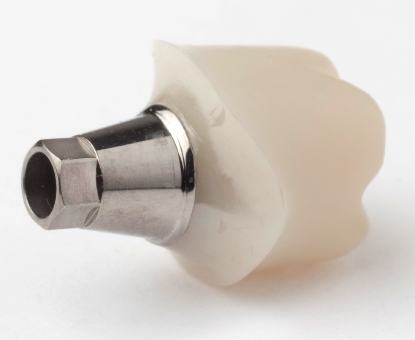 Implant direct to fixture: When the implant fixture is in a viable position to simply design a custom made implant crown or bridge direct into the implant fixture. This is determined as to the positioning of the fixture and is definitely a secure option. Hybrid Implant bridges – used in cases of full reconstruction of maxilla or mandible. Supported by a metal substructure and can be finished in acrylic or Porcelain fused to metal. Implant Bars – A fixed appliance for denture prosthesis.